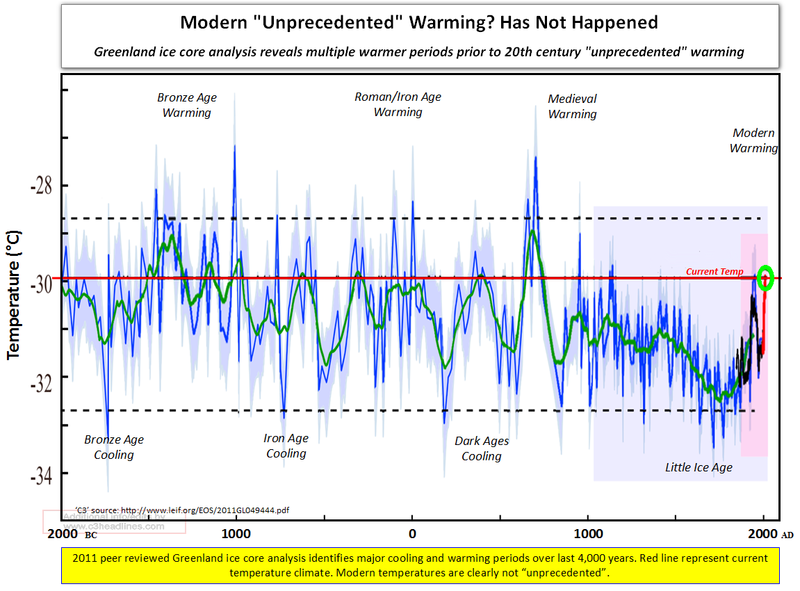 It appears that in Greenland at least, the current warming cannot be said to be “unprecedented”, since similar magnitudes and rates of warming are present in several previous eras. Man certainly didn’t cause those warming periods, so natural climate change obviously had a significant effect on Greenland temperatures over the past 4000 years. … we reconstruct Greenland surface snow temperature variability over the past 4000 years at the GISP2 site (near the Summit of the Greenland ice sheet; hereafter referred to as Greenland temperature) with a new method that utilises argon and nitrogen isotopic ratios from occluded air bubbles. The estimated average Greenland snow temperature over the past 4000 years was −30.7°C with a standard deviation of 1.0°C and exhibited a long-term decrease of roughly 1.5°C, which is consistent with earlier studies. The current decadal average surface temperature (2001–2010) at the GISP2 site is −29.9°C. The record indicates that warmer temperatures were the norm in the earlier part of the past 4000 years, including century-long intervals nearly 1°C warmer than the present decade (2001–2010). Therefore, we conclude that the current decadal mean temperature in Greenland has not exceeded the envelope of natural variability over the past 4000 years, a period that seems to include part of the Holocene Thermal Maximum. Unfortunately, it does little to dampen the effect of the preceding paragraph. Namely even with the additional CO2 presently in the atmosphere and its accepted small warming effect, Greenland was still warmer in the past. « Man-made climate change "began 3,500 years ago"
This planet manages itself,simple fact.Man is but a pimple on its rear end who has far too high an opinion of his abilities to change the way this planet functions. yes thats why it was named GREENland. the climate change nuts even have a theory for that-they say a Viking leader told everyone it was green to get them to emigrate there lol. It’s no wonder the team uses dendro chronology for climate records. They don’t show any signal if it goes up by a degree above average or down by a degree below average so ….climate stability. “The surface of most of Greenland is now entombed by a thick ice cap, but some time during the past 800,000 years the southern part of the island actually lived up to its name. It was covered by a thick, verdant boreal forest that would have been similar to what is currently found in many regions of Canada. A paper outlining the discovery and published in the journal ‘Science’, also said, “The ice sheet covering the ancient forest existed during the warm, interglacial period that existed 116,000 to 130,000 years ago, when temperatures were about five degrees warmer than today. The global average lower tropospheric temperature anomaly currently sits at -0.09 deg. C. Even using worst case catastrophic AGW scenarios, a rise of 5 deg. C. would still keep us within natural variants, albeit very unlikely. Why did they do the naughty graph splicing ? A telling story enough without it. Yeah. That’s why the Vikings called it “Greenland” It was green with vegetation. Before the bronze age Greenland had temperatures much higher than this graph shows. Actually Flannery and co think that man DID cause Greenland to be warmer in the past, through farming and forest clearing since ~10,000 BC. That’s why they want to call the period since 10,000 BC ‘the anthropocene’. Nothing can be natural, of course.